I’m very excited today, as I finally got round to playing the new edition of Runebound that was released back in November. Having bought it at the time, I was still unconvinced by the changes from second edition, which remains one of my all-time favourite games. However, the announcement of expansions had gotten me interested, and so in the spirit of the day, I’ve given it a whirl! And it was amazing. 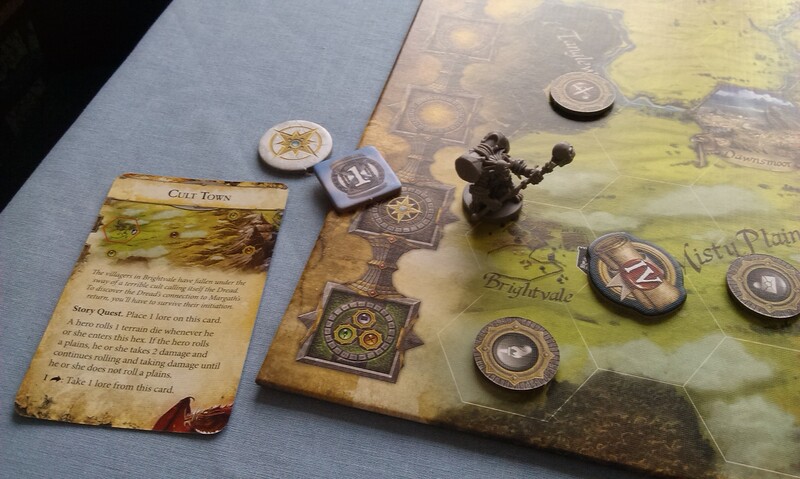 While this new edition of the game is still set in Terrinoth, and follows some old favourite heroes on a very familiar map, the game feels a lot different to the old version, almost to the extent that you’re pretty much playing through a new experience. I was learning the game as I went, so it took me over 2 hours to play through (solo), and I didn’t read any of the lore on the cards as I was making sure I was getting the mechanics right, but I have to say, the experience is really smooth, and you get the gist of it really quickly, thanks in part to the new method of writing rulebooks. The game is no longer merely a ‘level-up until you can destroy the bad guy’, but a scenario-driven game that uses a timer somewhat reminiscent of the doom track ideas from the previous iteration. The time track is run through twice, first comes Act One, then Act Two, which interacts with the scenario in some way. Each scenario has a set of ten story cards, which are drawn at set points on this timer track, and most of them have a Quest effect that usually benefits you in some way, though the picture above is a bit of a hindrance as well. This benefit often takes the form of giving Lore tokens, which have some way to interact with the scenario: I was playing the Ascendance of Margath scenario, and Lore tokens here give you the boon of reducing the big dragon’s health when you eventually fight him. On your turn, your hero has three actions to choose from among moving, resting, training (gaining skill cards, more on this shortly), adventuring, and shopping. You no longer throw all five dice all the time, but have a speed that denotes how many dice you can throw. Movement is also different insofar as many of the hexes have rivers running along their edges, and you need to expend the water side of a die in order to cross it (rather than choosing to spend, say, a forest side to move into a forest space). This does present some interesting options, though there is also a wild symbol that can be used for any terrain type. There are only four Free Cities on the new board, but a multitude of smaller features, such as strongholds and shrines, which you can often interact with in a manner similar to cities (healing and trading, for instance). Skill cards are gained through training, though you do start with a basic hand of them. When you train, you draw three cards, then discard down to your hand size, so this can be a useful way of cycling through unwanted cards. Whenever you test an attribute, rather than rolling a d10, you instead draw a number of cards off the Skills deck and, for every card with a starburst icon on the top-right, you score a success. This means the deck is going to cycle through a few times during a game, especially with more people playing. The attributes are body, mind and magic, much like second edition, though a major difference here is how you level-up. 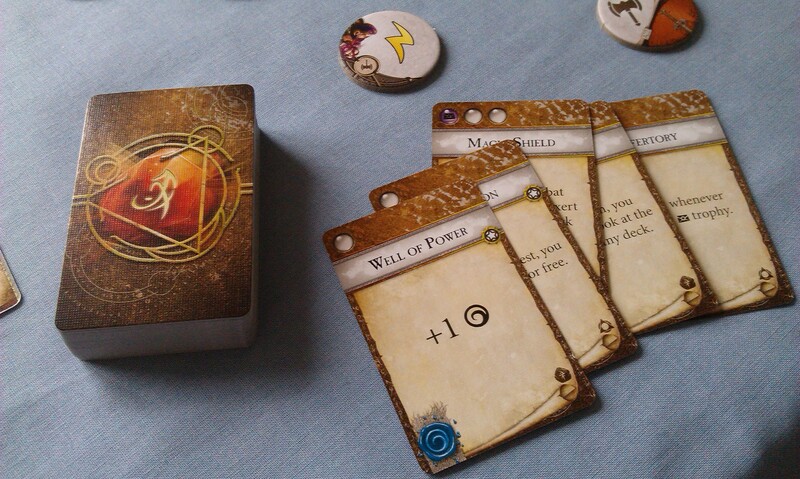 When you complete adventures, you don’t take the adventure jewel token from the board, but instead you take the card. You then use these cards to essentially “buy” skill cards – the icons along the top of the cards show how many adventure cards you need to discard in order to buy them. I find this really interesting as, not only does it mean you can level up after potentially only completing one adventure, but you actually get useful skills to use in the game, rather than just buffing your stats in a specific category. Adventures come in three types: combat (orange), social (purple) and exploration (green). These three decks have all types of cards within each but, as a rule, the green deck will have more quests – requiring you to interact with a specific hex on the board to gain benefits – while the social deck will have more events – cards where you can essentially choose what happens – and the orange deck obviously has more enemies. Rather than going through progressively more difficult colours of enemies, the orange deck will have enemies of all levels for you to face. Combat is where the biggest (to my mind) change comes, and one of the most controversial changes, at that: combat tokens. Instead of d10s, each hero starts with three combat tokens specific to that hero, and has the option of buying items at market in order to gain more tokens to add to the pool. 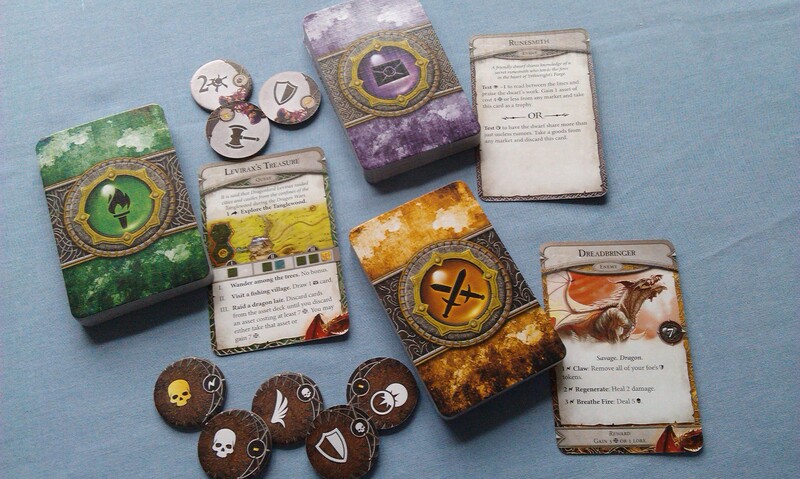 Enemy cards always start with five combat tokens, and when Act 2 hits, a sixth token is added. Final boss monsters also add a seventh token to the mix specific to that monster. 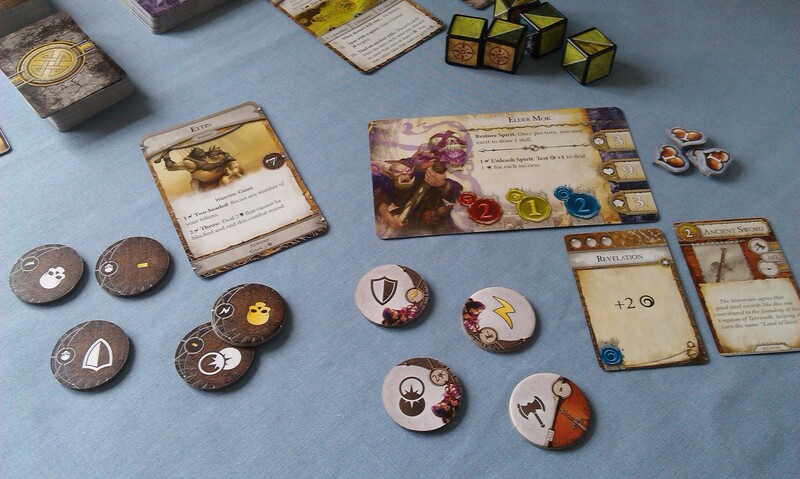 These tokens have various symbols on them, such as shields for defending wounds, axes for hero damage, skulls for monster damage, the lightning-bolt icon (“surge” for you Descent fans) to trigger a character ability, etc. There’s also a double-up icon, that one roughly in the centre in the above photo, which allows you to place another token on top of it in order to double the effect, and a feather-icon that allows you to flip one of your tokens after casting if you don’t like the result (the smaller circle on each token tells you what’s on the reverse). Lastly, there’s a kind of splatter-type of symbol that represents magical damage specifically. During a combat round, you take your token pool and “randomize” them, before casting them either like dice, or flipping them like coins. 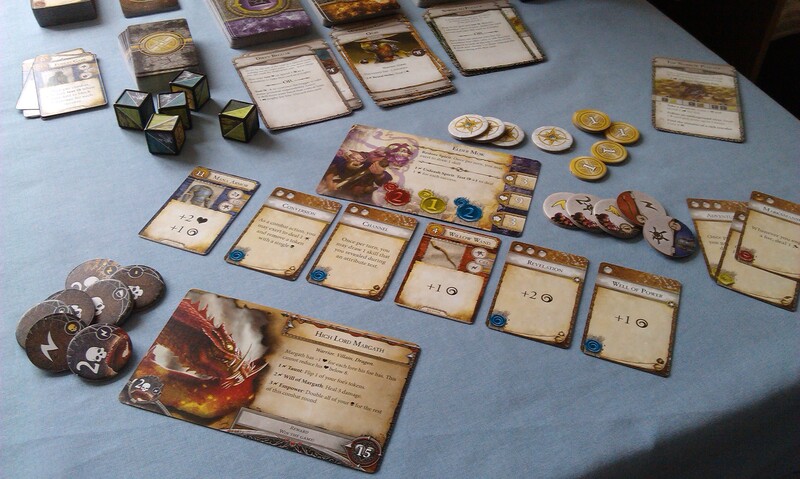 I treated mine essentially like dice, though tried to do a bit of a flourish as if I were casting runes or something! Simple things. Some icons are golden on the tokens – the person with the most gold icons has initiative and goes first. In the case of a tie, the monster goes first. The rules state that another player takes control of the monster when you fight, and decides the order of battle etc, but I was playing solo in order to get to grips with the rules, so just cast them all at once, and always chose the most beneficial act for the monster. It wasn’t as complicated as it might seem, and I actually got knocked out a couple of times as a result of dealing double damage to myself… At any rate, Runebound 3 appears to be a pretty decent solo experience, much like the second edition. I actually really enjoyed the combat tokens aspect of the game, which surprised me because it was the aspect I was most unsure about. The fact the dice are blank plastic cubes that you put stickers on kinda put me off, but the tokens felt like the worst part to me. The fact that FFG have actually released duplicate tokens struck me as a lack of faith in their durability, however the cardboard is the usual FFG stock, and I’m usually real careful with my games, so I hope they’ll be okay for a long while yet. The scenario I was playing, Ascendance of Margath, was a lot of fun. Once Act 1 ends, Margath is spawned on the board by means of a token, six or seven hexes outside of Tamalir. Once Act 2 is over, at the end of each round you roll all five dice and move him one hex for every wild space rolled – if he gets to Tamalir, it’s game over. The first couple of times, I either rolled none or 1 wild side, so felt a little cocky and tried to keep going in my adventure, which I’m glad I did because it allowed me to gain one final skill before the final battle on the outskirts of the city! I was playing as Elder Mok, who has this really useful “surge” ability that allows you to test your Magic attribute +1, and deal magical damage equal to the number of successes you draw. When doing attribute tests like this, there’s a useful rule that lets you “exert” by discarding an unused skill card to draw another – as it turned out, this was exactly what I needed to do enough damage (plus those Lore tokens!) to destroy the big dragon and win freedom for Terrinoth! I really enjoyed this game. I think I surprised myself just how much I enjoyed it, seeing as how I like the second edition so much that I was not entirely convinced this would be a good successor. Sure, when it was first announced, I was pumped, but once I got it in my hot little hands, I felt a little sad about things like the dice and the tokens. However, now that it’s spent some time on the table, I have to say, I’m sold. The game is re-implemented so well, I’m really looking forward to a long future with this side-by-side with the second edition. It seems like a very long time since I’ve really managed to catch up with the new games offerings from Fantasy Flight, but the last few days have seen a couple of things announced that have really gotten me excited for this stuff like I haven’t been in a long time, so let’s take a look! Top of the list for me is this announcement from Wednesday, two new expansions incoming for the third edition of Runebound! I picked up third edition when it was released, but it has been lying un-investigated for almost six months now. I guess a large part of this ambivalence is due to the fact I love the second edition so much. However, reading this announcement has gotten me excited for the game – more so, in fact, than the actual release! – and I’m planning to bring the game to the table tomorrow for International TableTop Day. It’s my intention to get a blog written up post-game with my initial thoughts, anyway, so keep an eye out for that! 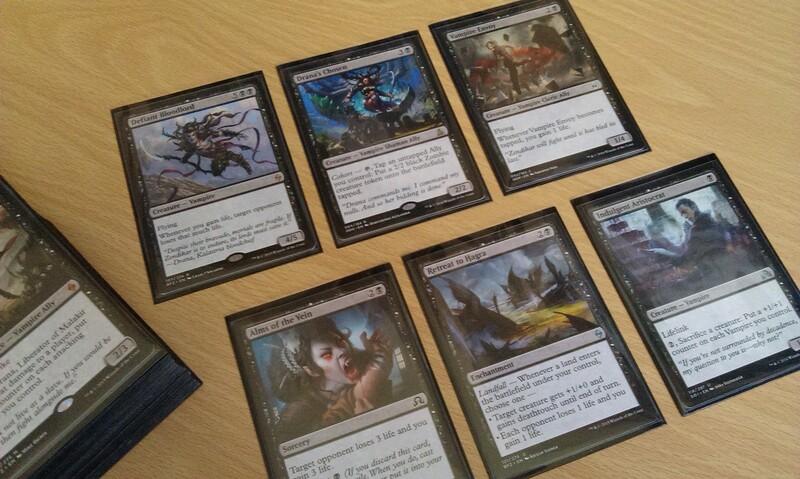 The two new expansions look amazing, anyway, and a really nice way to expand upon a game. First up we have Caught in a Web, a scenario pack that seems to feature tons of theme in the form of Ariad, the sorceress nemesis that Descent players will be familiar with from the Labyrinth of Ruin expansion. 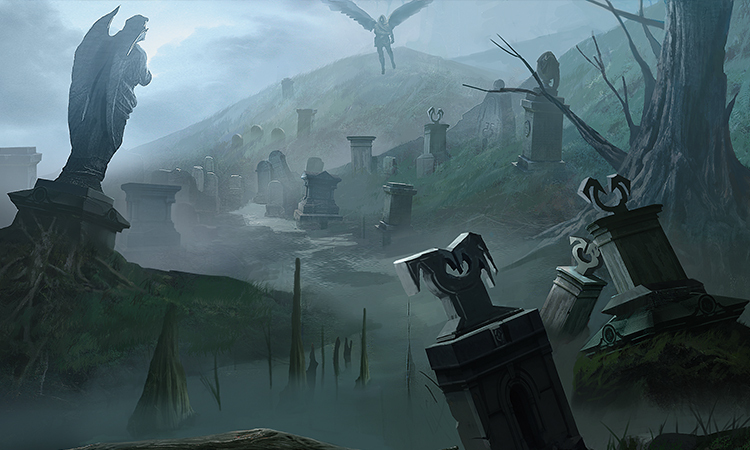 From what we know of this Runebound implementation, Ariad will stalk the land in spider form, seeking to destroy four of the Free Cities of Terrinoth, which sounds like a super-thematic game experience, really exciting. The Gilded Blade is an adventure pack that appears to be in the “more of the same” category of boardgame expansions, which I am more than okay with seeing. New skills and assets, and new encounter cards, are all more than welcome in this kind of game to keep it fresh and exciting. Both packs each come with one new hero – I say “new”, but both are veterans of Runebound second edition: Red Scorpion was in the older base game, and Jonas the Kind was one of the infamous four promo heroes. I love the fact we’re seeing old favourites in new sculpts (new for Runebound: Jonas the Kind can be found in Treaty of Champions in his new incarnation), as these heroes are the classics that I have enjoyed taking through Terrinoth on adventures in the past. I cannot wait to try this game out tomorrow, and I cannot wait to get my hands on these expansions when they hit over the summer! Something that may have flown a little under the radar is this print-on-demand expansion for Elder Sign that I’m really excited by! A deck of 50 cards split between Phobias, Epic Battles and Epitaphs, it looks like a totally awesome way to add in an extra bit or two to increase the theme of the game. I love it! 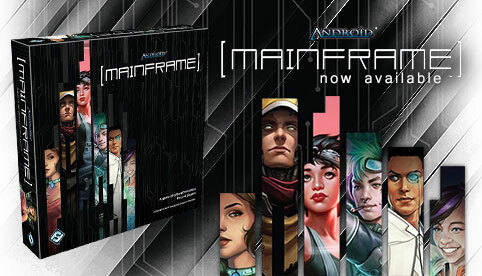 I ordered it as soon as the news article went up, along with a game mat for Android Netrunner that I’ve wanted for a while, and at the time of this writing, these products have just yesterday landed in the UK. Can’t wait to get my grubby mits on them! 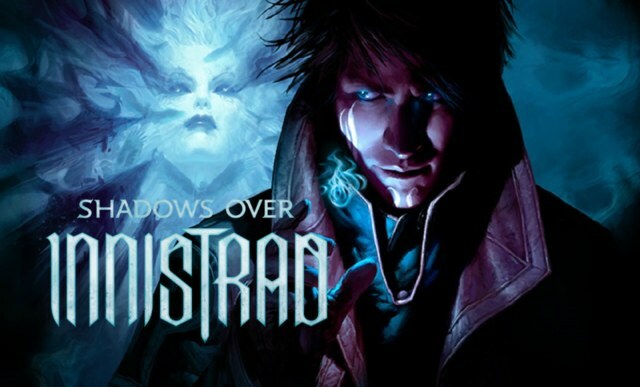 On the subject of Netrunner, I can’t not mention this game, which has been announced as now available. From having read the previews, it feels a lot like a re-creation of the LCG where all players are Runners going up against the Corp – I’ve been trying not to really look into it too much simply because I’ve grown to love the card game so much lately, but that very enjoyment is now making me think maybe this could be worth investigation. I’ve seen it available for £24, so it would hardly break the bank, but I just don’t feel a need for it right now. Warhammer Conquest is another LCG that I’ve been really enjoying since I began to play it with some gusto a month or so back, and I’m particularly looking forward to the Legions of Death deluxe expansion, which will bring my favourites, the Necrons, into the game! 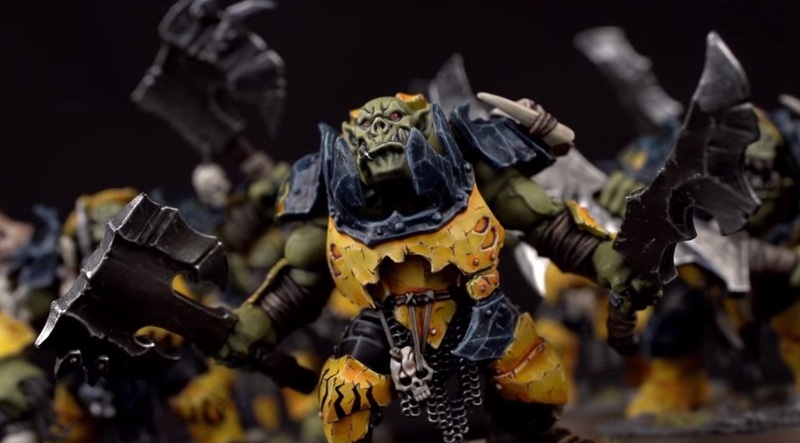 I’m feeling a little jealous that all of the other factions have so many cards while these guys will be entering the game following two full cycles, and their mechanic of using generic soldiers as chaff just makes that worse, to my entitled geek mind! I’m only partially serious – I wish they’d been able to bring the deluxe expansions for both Tyranids and Necrons out sooner, out of cycle if necessary, to ensure these factions aren’t left behind. But I suppose we’ll see when they eventually appear just how “left behind” they are. The fourth expansion for the upcoming Death World cycle has been announced, Searching for Truth, and features a new Necron warlord – Illuminor Szeras! Of all the Necron named characters in 40k, I like him the most, as his model is just the right blend of creepy and weird that really fascinates me about the Necrons. My own attempt at the guy isn’t the greatest, but I enjoyed painting him all the same. In the game, he gains a resource whenever damage is removed from Necron units, and given the cards coming for the faction, this doesn’t look like it’ll be too difficult to accomplish! Looks like a more high-risk strategy than I usually go for in games, but definitely one that I’m looking forward to checking out! Finally, let’s take a look at the fifth Saga expansion for Lord of the Rings LCG that deals with the events of the actual book itself – The Flame of the West. Long-time readers of my blog will probably remember that I’ve often called this game my all-time favourite game, yet I’ve barely played it at all for so long now, I feel like such a terrible person! 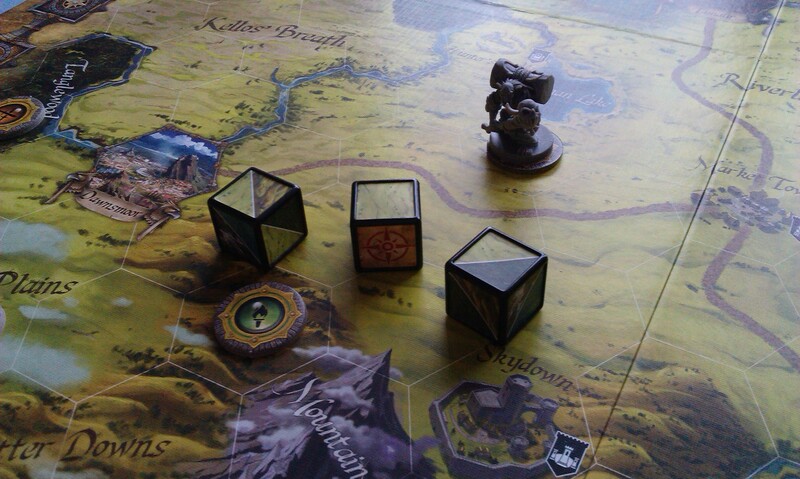 In fact… the last time I played any of the quests was 7 September, when I went through the Voice of Isengard expansion. That is shocking! Recently, I’ve noticed I’ve been feeling in the mood for a game but, due to having my dining table choc full of half-painted miniatures, I’ve never gotten round to it. Hopefully soon I can get some more games in, and reacquaint myself with Middle Earth! 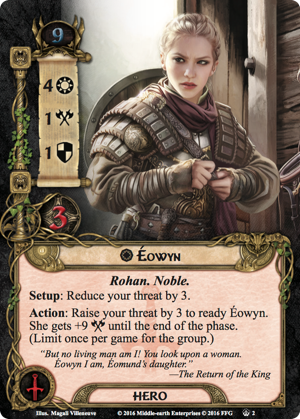 The new Tactics Éowyn is worth mentioning as well – what a special skill! 4 willpower in a Tactics hero is going to be so useful anyway that she will definitely find her way into a lot of decks, but the ability to deal 10 damage for a threat-raise of 3 should be really handy in the multitude of quests we now have that time a boss-type enemy until late in the game. It’s also super-thematic for the hero, too, so a massive thumbs-up from me there! Well that’s all I wanted to talk about today – so excited for some of these games, it’s just untrue! What about you guys? Looking forward to more for Runebound? Can’t wait to slay the Witch-king? Let me know in the comments! Author spalanzPosted on April 29, 2016 Categories board gamesTags Android, board games, card games, Fantasy Flight Games, LCG, Living Card Games, Lord of the Rings LCG, Necrons, new games, Runebound, Warhammer ConquestLeave a comment on New Games! I’ve been continuing the Heresy this week, with book eight in the series from Black Library: Battle for the Abyss! This book was fairly interesting, though also really quite sad. But let’s talk story first – and please beware, I will be talking spoilers! The book begins with the enormous starship Furious Abyss being launched from orbit around Saturn, with the mission to destroy Macragge. Encountering and destroying an Ultramarines ship at the beginning of its maiden voyage leads to a rag-tag coalition of Astartes from four different Legions following the immense ship into the Warp – World Eaters, Space Wolves, a Thousand Son, and a small band of Ultramarines, led by Captain Cestus. The main part of the book is therefore a short battle, then a chase into the Warp, before another short battle during a stopover, before a second chase into the Warp and a concluding pitched battle above Macragge. I actually thought I was going to be annoyed by this structure, as it seemed to be really narrow in focus, but given the large canvas of characters, it makes for a pretty interesting story! I’ve mentioned it before, but something I enjoy a lot about these novels is discovering how each Legion is different from the others, despite essentially being a collection of Space Marines. 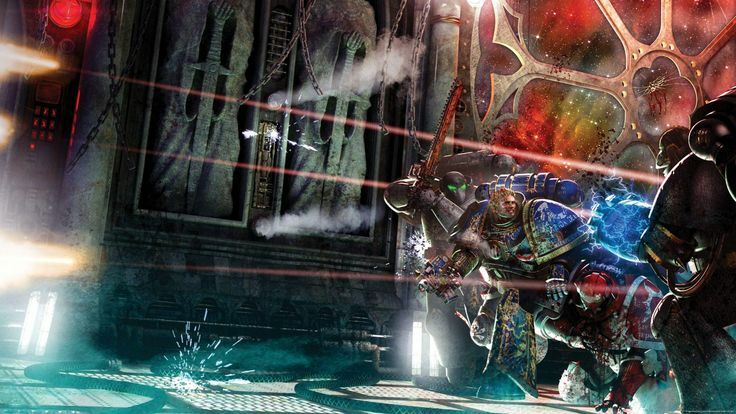 While we don’t really get a lot of that with the Ultramarines, enough is sketched in – along with details of the Space Wolves and Thousand Sons – while the Word Bearers are investigated quite closely. 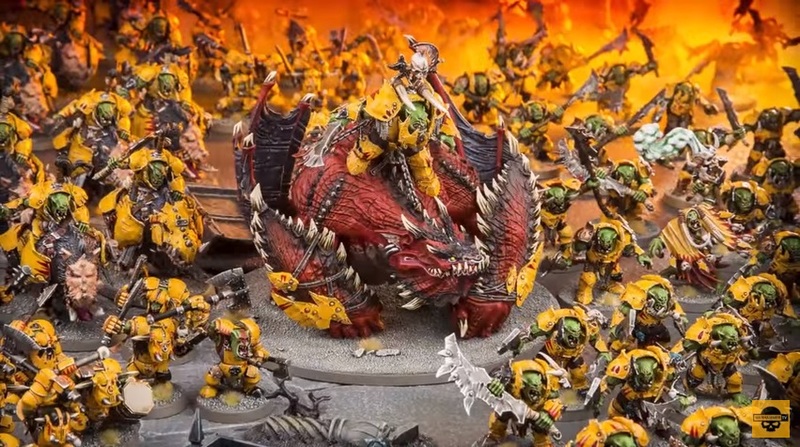 I’m not a huge Space Wolves fan, and the World Eaters are frankly boring, but something I was hugely interested by was the Thousand Sons lore we get along the way here. The XV Legion, the Thousand Sons are essentially a Legion of psykers, censured under the Edict of Nikea that forbade the use of psykers in battle, and so regarded with some suspicion by their brother Astartes. Mhotep, the lone warrior we follow, says he wishes to re-establish a measure of trust with his comrades, but as the story moves along he is forced to use his psychic ability to save his battle brothers time and again, while being regarded with hostility at best. It’s a deeply sad tale, and I find it interesting when we see the wider lore of the Thousand Sons essentially wanting to be a Loyalist Legion, but being shunned by the rest of the Astartes. Mhotep is a new favourite character of mine, not only because he’s like some kind of Jedi badass, but because of the stoic manner in which he accepts his brothers. The Ultramarines come across a little, well, boring here. 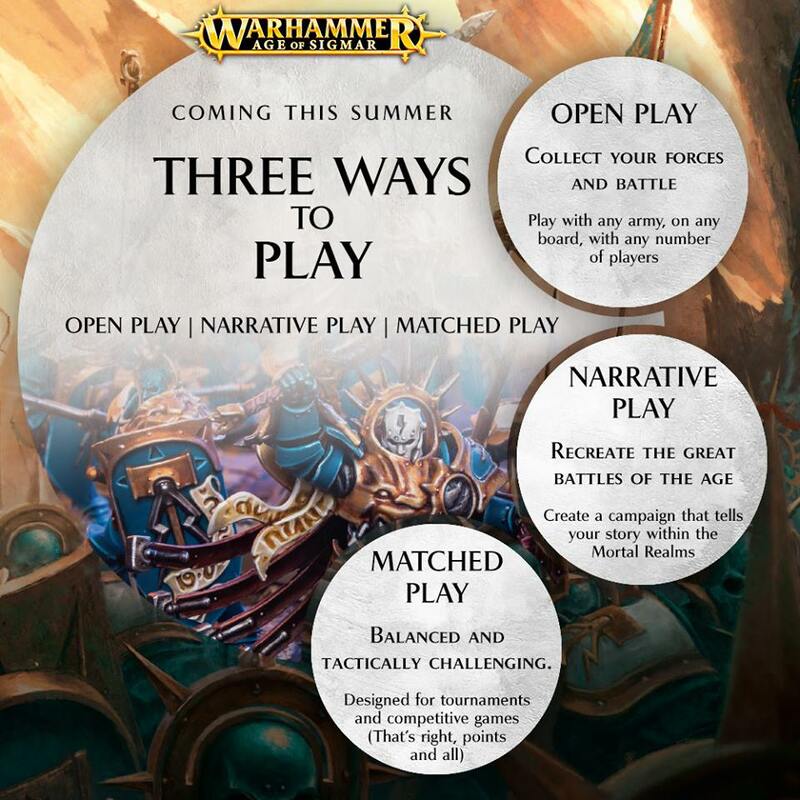 Despite having Cestus as something of the central character of the story, we don’t seem to get a lot of information about them, which is a little symptomatic of the Warhammer universe at large – Ultramarines are so often equated with generic Space Marines that it takes a very specific writer to really make them interesting (that writer is, more often than not, Graham McNeill). At any rate, the book feels a little like a slog at times, but the conclusion is just epic! The loyalist band manage to board the Furious Abyss and, after all manner of horrible things happening, destroy the leviathan by blowing its main reactor. I thought it was quite poignant to see the marines whittled down until we had just the captains of the Ultramarines, Space Wolves and World Eaters left, and seeing the three of them work together to destroy the Word Bearer’s plans – knowing the World Eaters are a Traitor Legion – was really intriguing. I believe we get to see more of these types, such as Nathaniel Garro and Garviel Loken, marines who refuse to turn traitor along with the rest of their Legion, so that should be good! Unfortunately, I felt incredibly bummed-out after finishing this novel. I warned you about spoilers, so don’t blame me when I tell you this: everybody dies in this book. All of the main characters. Some of them quite awfully, as well. Brynngar, the Space Wolf, jumps into the reactor. Skraal, the World Eater, is stabbed through the eye lens (that happens a few times, actually). Cestus kills the Word Bearer admiral, Zadkiel, only to bleed out from several wounds he received during the final battle. However, the saddest of all, for me, was the death of Mhotep, who gave his life to keep the Word Bearer’s Warp-spawned demon Wsoric on the material plane long enough that it was weakened, enabling him to stuff a grenade inside the demon’s body. He dies saving the Imperium from the predations of the Warp-spawn, but nobody he has encountered during the course of the novel is remotely grateful for his intercession. Just so sad!